For updated information on skating and sledding conditions, please visit our winter activities page. 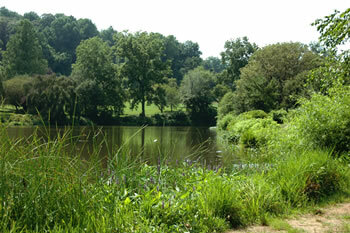 Holmdel Park is one of Monmouth County's most popular locations for active recreation and nature appreciation. 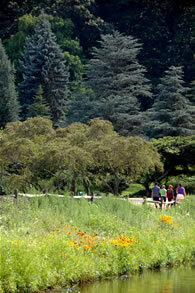 Acquired by the Park System in 1962, nearly one million visitors enjoy this 566-acre site yearly. 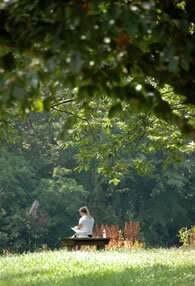 This park features the David C. Shaw Arboretum, fishing, picnic areas, four tennis courts, two playgrounds, ice skating, sledding and 10 miles of trails - including a 1/2 mile paved loop linking the Pond View and Forest Edge areas of the park with group picnic facilities and playgrounds. The park also features two historic sites - Historic Longstreet Farm and the Holmes-Hendrickson House. Longstreet Farm is a living history farm where Park System staff recreates life as it was during the 1890s. Learn more about this site and see upcoming activities. The historic Holmes-Hendrickson House, at 62 Longstreet Road, is operated by the Monmouth County Historical Association (MCHA). For information on tours and events for this site, please see the MCHA web site. 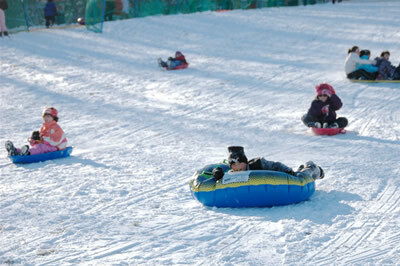 When there is snow on the ground and conditions are safe, Holmdel Park is the place to go for sledding fun. Ice Skating is allowed when the ice is more than five inches thick. When conditions are safe for these activities, the park is open from 8 a.m.-7 p.m. Sunday through Thursday and from 8 a.m.-9 p.m. Friday and Saturday. For the most updated information on current conditions, contact the park office at 732-946-9562. 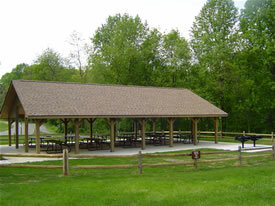 Holmdel Park features reservable group picnic areas and is a great spot to host a family reunion or get together. Garden State Parkway to Exit 114. Southbound, turn right onto Red Hill Rd; northbound, turn left onto Red Hill Rd. Follow Red Hill Rd. to Crawfor's Corner/Everett Rd., turn right (heading west). Follow Crawford's Corner/Everett Rd. to Roberts Rd., turn left. Follow Roberts Rd. to Longstreet Rd., turn right to Park on left. State Hwy. 34 to Roberts Rd. (1.75 miles north of Rt. 520). Southbound, turn left; northbound, turn right. Follow Roberts Rd. to Longstreet Rd., turn left. Park is on left. State Hwy. 35 to Holmdel/Keyport Rd. Northbound, turn left; southbound, turn right. Follow Holmdel/Keyport Rd. to Crawfords Corner Rd., turn left. Continue to Longstreet Rd., turn right Park is on right.